A wide cross-section of Americans have experienced and encountered abusive behaviors online, according to a recently released Pew Research Center survey. And although this harassment can take many forms, some minority groups more frequently encounter harassment that carries racial overtones. This is particularly true for black Americans, a quarter of whom say they have been targeted online due to their race or ethnicity, compared with 10% of Hispanics and 3% of whites. Blacks and Hispanics are especially likely to view online harassment as a pressing issue. For instance, larger shares of blacks (74%) and Hispanics (72%) than whites (57%) consider online harassment to be a “major problem.” Blacks are also more likely to say it is more important for people to feel safe and welcome online than to be able to speak their minds freely (68% vs. 31%). Whites are more evenly divided on this question (51% vs. 48%), as are Hispanics (52% vs. 46%). 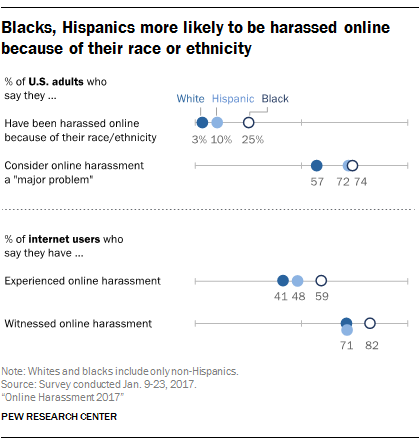 In total, nearly six-in-ten black internet users (59%) say they have experienced any form of online harassment compared with 41% of whites and 48% of Hispanics. In terms of the specific behaviors they have faced, notable shares of black internet users say they’ve been called offensive names (38%) or purposefully embarrassed online (34%). Black internet users are also somewhat more likely than whites to have witnessed the harassment of others online (82% vs. 71%). And 54% of black internet users have witnessed particularly severe forms of online harassment against others (such as physical threats, stalking, sexual harassment, or harassment over a sustained period of time). Observing harassment can leave a strong impression, especially among blacks and Hispanics. After witnessing online harassment, for example, 43% of black internet users and 44% of Hispanics have felt anxious that something similar might happen to them, compared with 33% of white internet users.